Dust mite proteases promote cytokine release from the human respiratory epithelial cell line BEAS-2B in a dose-dependent manner. 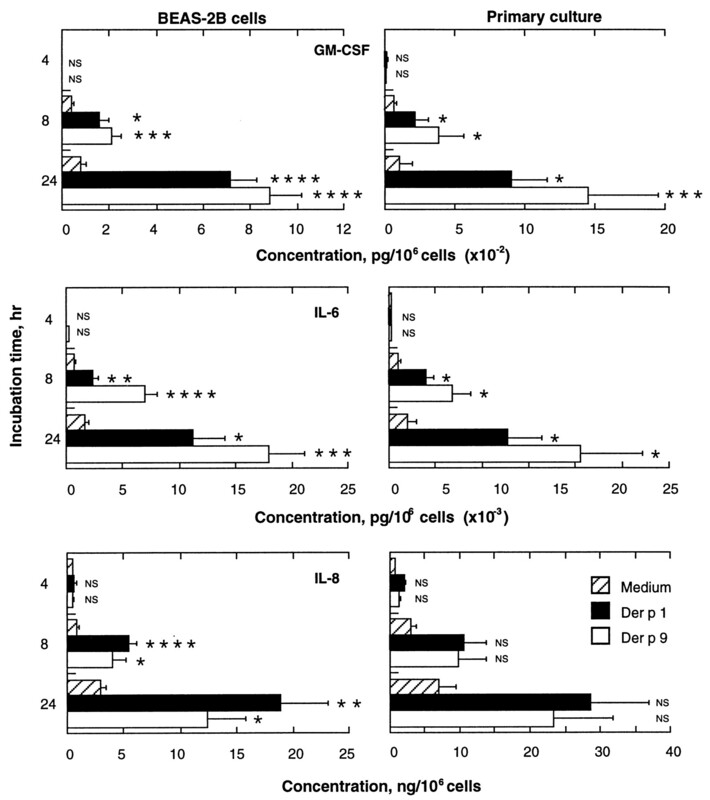 Cell monolayers were cultured for 24 h with basal medium that was devoid of growth factors and then stimulated with increasing concentrations of either Der p 1 or Der p 9 for 24 h. The presence of GM-CSF in supernatants was determined by bioassay, whereas IL-6 and IL-8 were measured by ELISA. Data are expressed as the means ± SEM per 106 cells from three independent experiments that were performed in duplicate. The statistical significance of the differences in means between Der p 1- and Der p 9-induced responses at various concentrations was determined by the Student t test; ∗, p < 0.05; ∗∗, p < 0.02; ∗∗∗, p < 0.01; ∗∗∗∗, p < 0.001. Dust mite proteases promote cytokine release from the human respiratory epithelial cell line BEAS-2B and from primary cultures of human bronchial epithelium in a time-dependent manner. Cell monolayers were cultured for 24 h with basal medium that was devoid of growth factors and then stimulated with basal medium or 100 ng/ml of Der p 1 or Der p 9. The supernatants were harvested at 2, 4, 8, and 24 h, and the presence of cytokines was determined as described in Figure 1. Data are expressed as the means ± SEM from four independent experiments that were performed in duplicate. 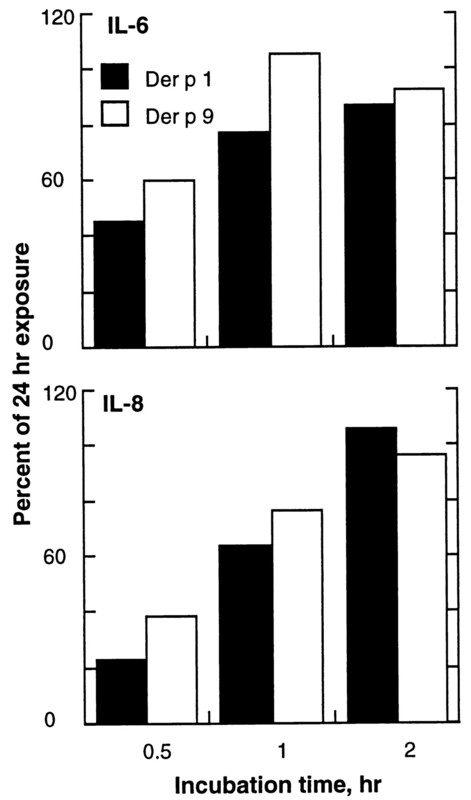 Because cytokines were not detected at 2 h after protease exposure, this timepoint was excluded from the figure. The statistical significance of the differences in means between the protease-induced responses and control responses at the timepoints indicated was determined by the Student t test; ∗, p < 0.05; ∗∗, p < 0.02; ∗∗∗, p < 0.01; ∗∗∗∗, p < 0.001. 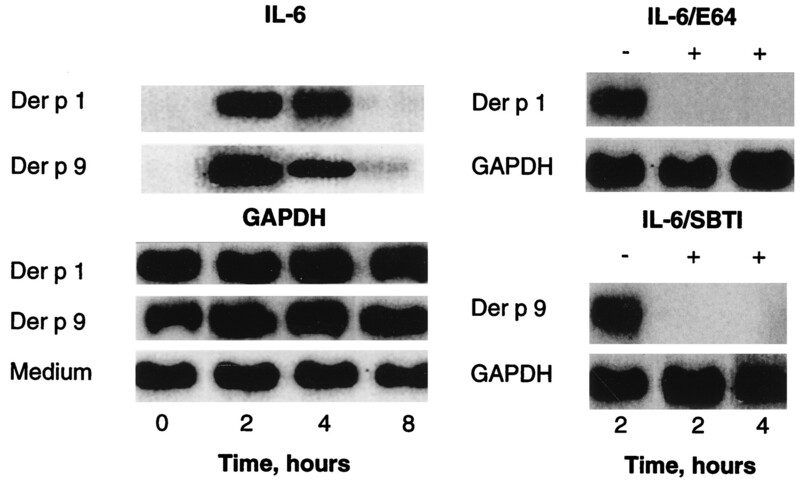 The effect of Der p 1 and Der p 9 exposure on the release of IL-6 and IL-8 from BEAS-2B cells. Cells were incubated with protease for the times indicated, and culture medium was removed. The cells were then washed and reincubated with basal medium until a combined incubation period of 24 h had elapsed. Data are expressed as a percentage of the response that was obtained after 24 h of continuous protease exposure. Northern blot analysis showing the effects of mite proteases on IL-6 cytokine mRNA expression as determined using 32P-labeled cDNA probes at the timepoints indicated. The left panels show the effects of the protease incubation time on expression; the right panels show the effect of pretreating the cysteine protease Der p 1 with E-64 and the serine protease Der p 9 with SBTI. Inhibitor was added (+), and mRNA was detected after incubating cells for the times indicated. Cells were also incubated with proteases that had not been treated with inhibitor (−). Control experiments were performed using a cDNA probe for GAPDH. 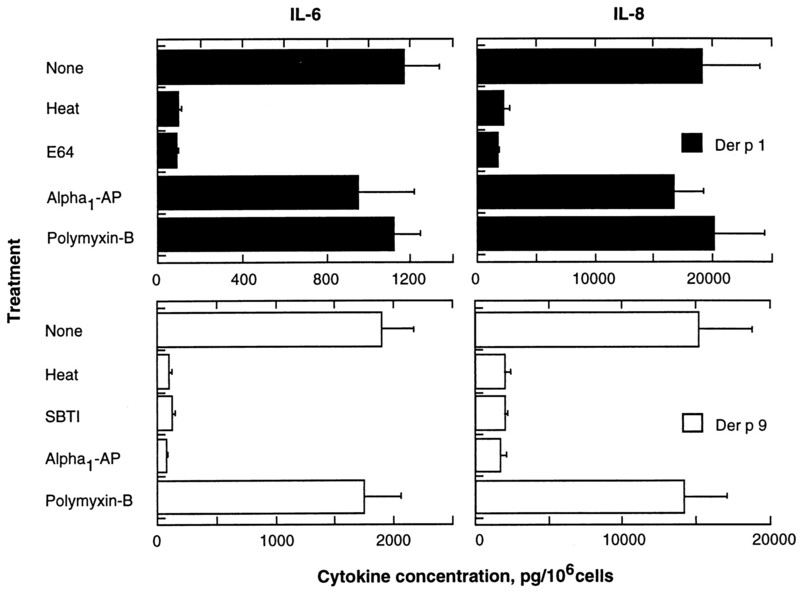 The mechanism of cytokine induction from human bronchial epithelial cells was investigated by incubating Der p 1 or Der p 9 with a variety of agents including SBTI (10 ng/ml), E-64 (10 ng/ml), α1-AP (100 ng/ml), and polymyxin B (50 μg/ml) for 20 min at 37°C before their addition to BEAS-2B cultures. 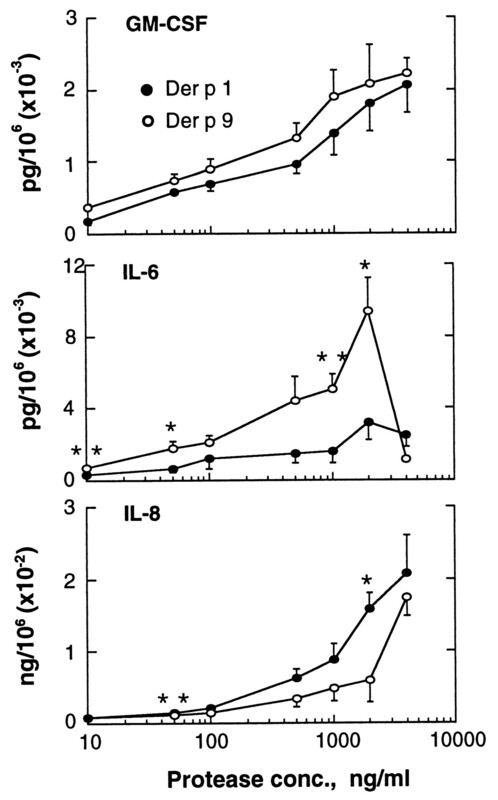 Cytokine release was measured by ELISA following 24 h of incubation with proteases and additives, and responses were compared with those that had been obtained with protease alone (none) and with heat-inactivated protease (heat; 60°C for 20 min). Data are expressed as the means ± SEM of three independent experiments that were performed in triplicate. Dust mite proteases Der p 1 and Der p 9 cause a rise in the calcium ion concentration in BEAS-2B cells. Data were collected by confocal microscopy and expressed as a ratio of fluorescence at 405 nm and 490 nm (×100) using the indicator Indo-1. The top two panels show the effects of 1 μg/ml of Der p 1 and Der p 9 on BEAS-2B cells, respectively. 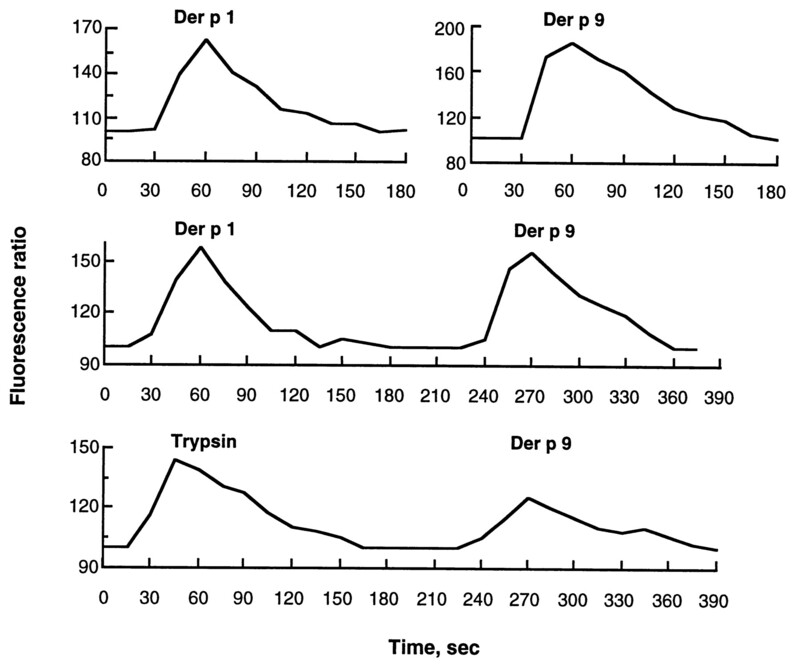 The middle panel shows the effects of the sequential addition of 1 μg/ml of Der p 1 followed by Der p 9 on the calcium ion concentration, and the bottom panel shows the effect of the sequential addition of 1 μg/ml of bovine trypsin and Der p 9 on the calcium ion concentration. Proteases were added after a 25-s initial scanning period. a A total of 1 μg of rIL-6 was incubated with varying concentrations of mite protease for 4, 8, or 24 h, and the concentration of IL-6 remaining was determined by ELISA. a Differences in mean values for individual proteases compared with those obtained with medium alone were determined using the Student t test (n = 6).